This Homeopathy shelf offers a range of products suitable for the treatment of colds and infections. This also includes Coughs, Sinusitis, Hayfever and other allergies. Nelsons branded products such as Coldenza, Sootha, Pollenna and Travella. 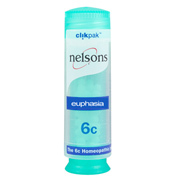 Nelsons is a leader in natural medicines and have been around for over 145 years. All over the world they are a known brand. Their aim is to bring the high quality products to more and more people worldwide. Homeopathy is a natural and safe alternative to conventional medicine which is suitable for all the family. Discovered in the eighteenth century, modern homeopathy has been successfully used by millions of people throughout the world.